What a day! It’s been so good to look into everything recorded and shot in the 5 days I spent in Paris for Fashion Week. Although I spent half the days I used to, it feels like I took so much more away from it. It is always a pleasure to attend shows and see the collections first hand. I am particularly fascinated with designers who have a fresh take on everyday clothing. Sort of like dressing a rockstar. Although I do have my “wow” moments when I see a magical dress coming down the runway.. not the romantic but the shiny fitted elegant and seductive kind of dress. Black, gold or silver.. sequins. The usual New Years Gala type of thing. 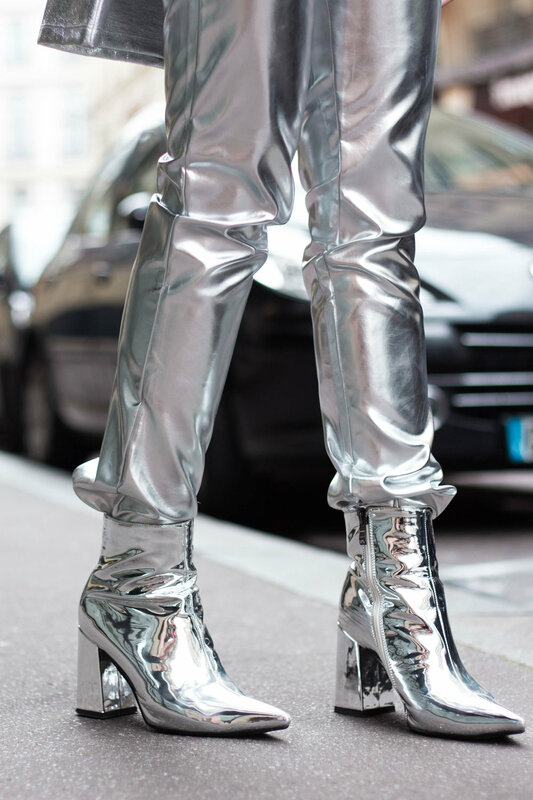 But when I am not into dresses, I want cool trousers, and creative jackets, and interesting shoes, not too much, just enough to put together that rockstar type of look that I like. I feel like AALTO provides a good selection of that. This time I was particularly into in the metallic pink pieces coming down the runway. And let me just say that the styling in it self gave me so much to take from. The high gloves (that are starting to pop everywhere) and the layered loose materials, although Summer. Super street. Super inspiring. As you know, every day of fashion week, I wore 2-4 outfits (honestly not far from a normal day back in London). So this look is what I wore in the morning for AALTO show, next look you will see is the one I wore in the afternoon, this same day, for Alexstorm. It is already up on Youtube. I will share the images here tomorrow. After all of it. We had a few after parties. The night started with dinner, followed by AALTO After Party and finished at KENZO’s After Party at Vanity Paris. I wore the exact thing you see here, except I switch my hair to a sleek high ponytail and the lipstick to red. No hat and sunnies (of course). About the look, I am so obsessed with this black velvet Marmont belt bag from Gucci. I’ve been wearing it a lot to events and parties. As you know, I am not a fan of big handbags - the more hands-free the better - so much so, some days my “bag” is my jacket’s pockets. But I feel that this one is perfect. It fits my phone’s 20mah battery - bigger than my iPhone 7 Plus! I know you want to talk about these trousers.. They are from MadButMagic. I’ve been looking for metallics like a Magpie. I’ve collected so much already, I feel I need to start holding back although Christmas and New Years are just a couple months away now. I decided to tie the silver jumper on the waist purposely to make it look like a space suit - might or might not be trying to get Elon Musk’s attention to get on the first official rocket to Mars. - The boots were no biggie at this point, can’t do a spacesuit without completing the shoes. Because the trousers are so thick, I went with a mesh bodysuit to make it look like a second skin and give it more silhouette. The thin sunglasses matched the futuristic look overall and the hat turned it into a proper space utility look.